Champagne was flowing again on Wall Street. In marking the fourth anniversary of the bear market bottom of 2009, the Dow Jones Industrial Index raced through its old high of 14,000 and reached highs in excess of 14,500, doubling its March 2009 low. In Toronto, we settled for Blue Light; while the S&P/TSX Composite set a 52-week high, it was up only 4% from a year ago, and is still down 12% from its 2008 all-time high. Meanwhile, in Vancouver, they are desperate for a cup of water. Instead of trading at highs, the TSX Venture Exchange (nee the Vancouver Stock Exchange or TSX-V) was setting two-year lows, down 28% from year-ago levels and 66% below its 2007 pre-crisis high. The recent underperformance of the TSX relative to the Dow can be summed up in one word — resources. Growth concerns have dampened investor desire to own the base metal, gold and energy stocks that comprise a large portion of the broad Canadian equity market. What has punished the TSX-Venture Index is not only its heavy resource weighting, but also its small and micro cap constituency. In the four years since the market bottom, investor appetite has waned dramatically for illiquid names, particularly those with no prospect for near-term cash flow. 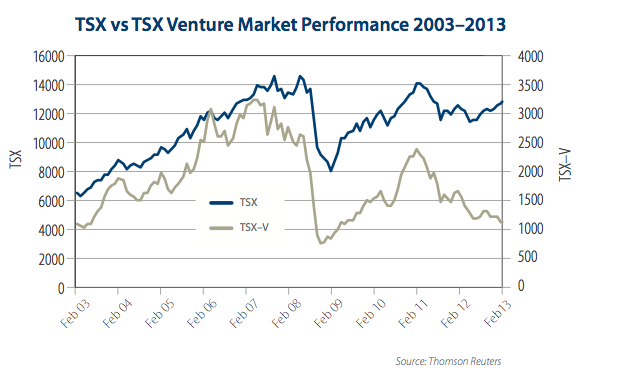 As you can see in the chart, the TSX Venture Index fell more than the TSX Index during the financial crisis, and has not recovered, diverging significantly from the TSX since early 2011. In an interesting irony, March also marked the annual PDAC (Prospectors and Developers Association of Canada) conference in Toronto. Normally a junior mining love-in, the tone this year was somber at best. If there was one theme that played throughout the conference, it was “there ain’t no money,” a damning sentence for companies who live to drill the next great hole. According to Reuters, Canadian mining financing is down 58% in the first two months of 2013, compared to 2012. Even more daunting, Northern Miner, the mining newspaper, recently reported that over 600 Canadian-listed junior mining companies have less than $200,000 in the bank! This is not a critique of either the Venture Exchange or the companies that comprise it. Rather, it shows how “risk-on” sentiment has declined over the past few years. Post-crisis, investor focus has been more on “how do I get my money back” than on “how much can I make.” The result is a preference for liquid, dividend-paying stocks. One of the hallmarks of the Leon Frazer strategy is investing in “backbone” companies, such as railways, pipelines, utilities, telecoms and financials. Backbone companies invest capital today to build an asset that can generate cash flow, hence dividends, tomorrow and into perpetuity. Junior resource companies, by contrast, invest capital today (and tomorrow, and next year …), in the hope that eventually they will discover a mine that can produce a commodity for a limited number of years at an unknown commodity price. Since new mines cost billions of dollars, the only hope for most juniors is to be bought out by a major. In the Leon Frazer world, buying a company today because someone else will pay more for it tomorrow, just doesn’t make sense. We prefer companies that pay us today and pay us more tomorrow. With the majors now being held to higher standards of shareholder friendliness, dividends from large resource companies are now growing. Unlike TSX-V companies, many large, liquid resource companies have solid balance sheets and operate as real businesses. In fact, the fastest dividend growth experience in LFA portfolios is coming exactly from the well-capitalized resource companies our clients own. When the cycle for resource investment turns, as it always does, we not only have a higher-than-ever income stream from our resource stocks, but a nice “warrant” on the cyclical recovery. In the meantime we get paid while to wait. This article was first published as Market Perspectives, March 2013.